Today we have another summary from a second set of Blind Reviews I went through. Just last week I posted a set of blind reviews, you can read it here. Tony also went through a set of a blind cigars as well from this same blind trade, read his summary here. I ended up with two sets of cigars to run through and this set is from @BenjyClark from twitter, a local cigar enthusiast way up here in Canada. I can’t stress how much I enjoy how the blind reviews remove all biases from your cigar smoking experience. Even if we may not know it sometimes, the band, price, and brand name can subconsciously affect your opinion. Take a read through and let me know your opinions and if I hit the nail on the head or missed the mark completely. A nice looking Robusto cigar with a light brown wrapper below the band and a dark chocolate wrapper above the band (This signature gave away the identity of this cigar! hehe). Gives off a mostly woodsy aroma on the wrapper and the foot. Pre-light draw brings more of that great cedar taste with a bit of creaminess added to the mix. The draw is a touch tight but I’m still getting a fairly good mouthful of smoke. Tons of woody/cedar notes through the first third with a bit of a creamy finish. Pairing well with my Mill Street Brewery Coffee Porter. Ash is strong and Zebra striped with some dark black spots but mostly light grey. The retrohale has a nice mild bit and a smooth creamy cedar finish. Getting some nice nutty flavors developing as the cigar passes the half-way mark, the cedar is still the most prominent flavor here. Now developing some espresso like flavors, a little bit bitter but not in a bad way, we’ll see how it progresses once I hit the darker wrapper. I was smoking pretty fast through the first half and has really slowed down now. 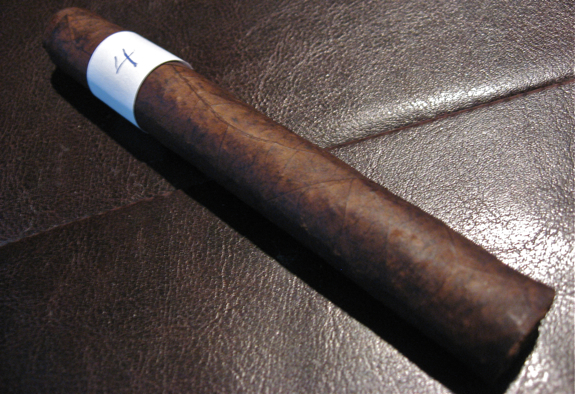 When I hit the dark wrapper, the creamy cedar slowly changed to a sort of creamy cocoa, a very nice transition. The cocoa and espresso hung around till the nub. Was pretty tasty cigar, I think having the darker wrapper at the halfway mark would have made it even better just cause I really enjoyed that part of it. A delicious cigar, I’ve been eyeing these ones for a while and glad I finally got the chance to try one. Definitely worth trying out, especially with a nice cup of coffee. A torpedo shaped cigar that is oddly tapered, seems to be a very slow taper. Looks to be a 5.5 x 50 or so. The wrapper is pretty unassuming, just a light brown color with a couple small veins and bumps. I cut it a fair ways in and still had a small opening and poor draw. Had to cut further after lighting cause I still had poor draw. Even with the second cut I feel like I’m getting lots of draw but barely any smoke. So far its making me feel like a budget stick. The foot lit up easily and right from the start had a large peninsula forming. Despite my efforts to get it going it kept getting worse. After about an inch I needed a major correction. Another indication of a budget stick here. Draw is still going poorly, may have to cut a bit more. Initial flavors are mostly of burning wood and cedar, not bad tasting but nothing earth shattering here. I’m getting a bit of dried fruit flavors here and there but it’s not sticking around much. The ash fell off just past the inch mark. Decided to poke the foot a bit with a toothpick and the draw FINALLY opened up! Much better now. Just an ok cigar, don’t think I would seek this one out again. Haven’t had many Cusanos but so far haven’t had any good ones. It’s one of the lines I just haven’t dove into yet. A very dark, rich looking cigar. The wrapper is a dark chocolate brown with highlights looking almost black. It is very evenly constructed with no major veins and a clean triple cap. 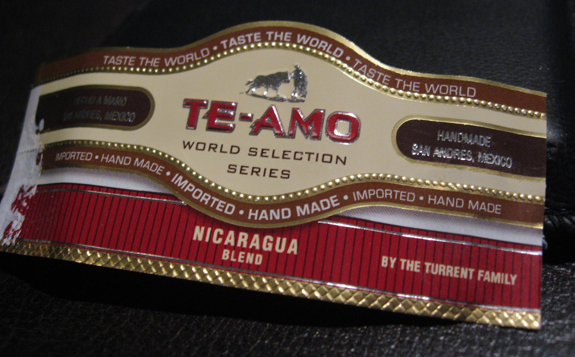 The wrapper has a sweet tobacco type of flavor and the foot gives aroma of hay, sweetness and a bit of coffee. Pre-light draw is mostly hay flavors with a touch of coffee added in. Initial draws are pretty bland, just tobacco and hay. Hopefully this gets more interesting. Starting to get a bit of coffee notes here and there after about an inch, nothing special yet. Ash is nice and clean and holding strong. This cigar seems familiar to me, but I’m not sure yet. It seems to be in the mild/medium range and has a very mild retrohale with no bite and a bland hay-like finish. I must say the construction is excellent and it’s smoking nice and slow, just wish it had more flavor. Approaching the half-way mark and still not much development in the flavor area. Now approaching the nub and still nothing. It’s not a bad smoke, just boring. The coffee flavors were always just barely there and disappeared a lot. Body built up to about medium, maybe a bit more. The construction was awesome though, never a burn issue, it gets points there I suppose. I’m gonna throw a guess out there. I smoked an AB MAXX awhile ago and it was very similar, well made but boring. If not that, then maybe a budget Nicaraguan. Post-Reveal Notes: Wow, hit this one on the head! This band was a little different from the one I had and after a little research it’s the same blend just in “traditional” sizes instead of the larger ring gauges the the silver banded MAXX line comes in. And the same blend indeed, they were all fairly straightforward. 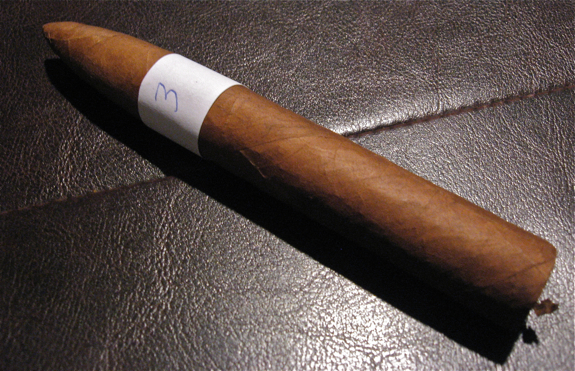 A very light tan colored wrapper and a smaller vitola, almost around a 4.5 x 48 or so. The wrapper has some bumpiness and a few medium veins but nothing that looks problematic. The wrapper and foot both have an aroma of cedar and a hay. The cut was a bit messy but the draw was just about perfect, getting some nice spice on the pre-light draw. Toasting was easy and fairly even, lit up nicely. Initial draws bring some interesting white pepper spice and a fair helping of cedar. Usually with spice like this you would get some bite on the retrohale but it was actually very mild with a smooth cedar finish. The ash and burn aren’t pretty but are holding strong. Ash looks a bit messy and in the darker grey tones. Burn had a wave right from the start but it hasn’t gotten worse or better, just strolling along. I think I have a good guess that this is an EP Carrillo cigar since I’ve had a few of them lately but none in this vitola, and it seems a little weaker in body. Seems very familiar though. Body started off mild and is slowly approaching medium but it never quite got there. Ash held on to about 1.5 inches, very nice. At the halfway mark I got some raisin or dried fruit type of flavor along with a bit of leather. Those flavors stuck around to the very end with very little bitterness. The dried fruits made me think of the 7-20-4, so I’m confused on this one. The burn was excellent the whole way through. I’m stumped on this one, don’t think I’ve had it before now. I’ve never really paid much attention to this cigar. Not sure why. It was definitely a tasty one and would make a great mild or early morning smoke. They are definitely on my future purchase list now. Looks to be a box-pressed toro sized cigar weighing in around 6×54 with a clean triple cap. The wrapper is rough and veiny with just one soft spot, the rest of the cigar has a nice medium spring to it. Pre-light draw is very grassy and earthy. The wrapper has pretty much no aroma and the foot has a bit more grassiness to it. When I first looked at this it appeared to be a Cuban but after the first couple draws I’m pretty sure it’s not. But that definitely does not mean I’m not enjoying it. So far I’m getting a very nice cedar flavor with hints of leather and a slight spice that I can’t quite put my finger on. It toasted up nice and easy and is burning very even, although it is burning quite fast. Although the draw feels good, it seems to be a bit airy as I’m not getting nearly as much smoke as I expect. Ash is a nice light grey color and is clean looking although it seems a bit weak. It still held on just over an inch. A few inches in the burn is starting to go a bit wavy and the draw is still airy. Neither is hampering the experience much but let’s hope they correct themselves. The flavor is still mostly leather and cedar, with a bit of that original grassiness joining the mix. The cigar has been fairly mild/medium for the most part and the retrohale has no bite and a woodsy finish. Found a small hole under the band that was causing the airy-ness, much better draw now and a mouthful of smoke. Around the half-way mark I started getting a bitter sweetness and the earthy notes came back. The grassy and woodsy flavors are still around while the minor spice and leather are gone. 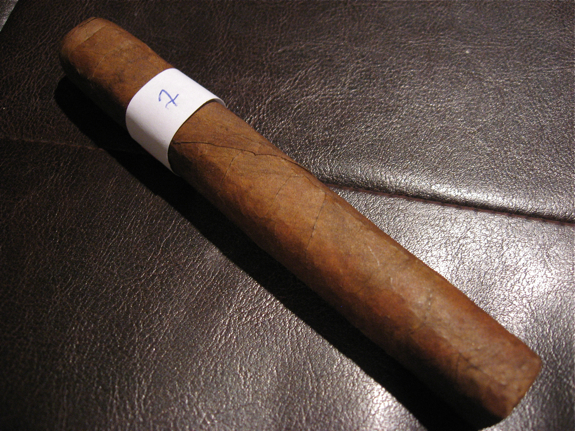 Post-Reveal Notes: hmmmm… an Altadis cigar… not surprised I was bored by it. Thanks for these, Daniel. Like I said before; it’s fun to see what your tastes discover when all factors with regards to price and marketing propaganda are well, factored out. Keep ’em coming! I have really enjoy these reviews. 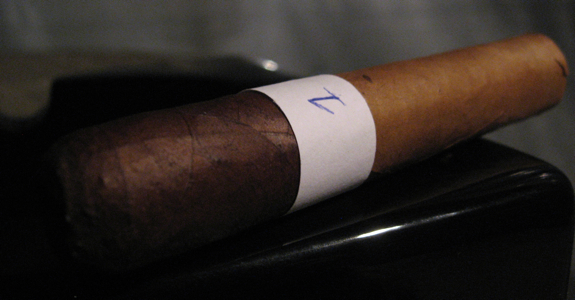 It is an intriguing idea to test, how we judge cigars w/o knowing what they are. Kind of puts our bias in neutral. I’ve got to find someone to try this with. Also, I am impressed with your ability to suss out the nuances of a cigar’s taste profile Daniel. I too am yet to smoke a Cusano or Cuvee I liked. Lame. Even the limited 2010 that Cuvee did a while back was eventless. But as usual, nice reviews. Keep it up. 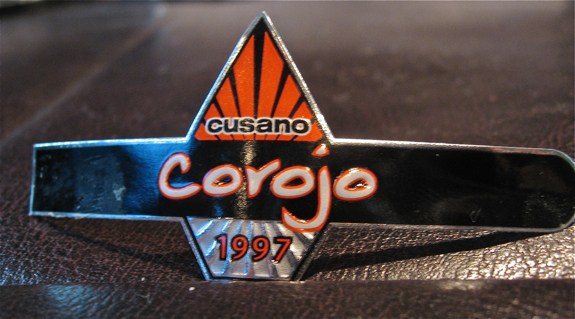 Thanks John, I actually was given a few Cusanos in a recent trade so I’ll have to give them a fair try now. Maybe there’s a diamond in the rough I’ve been missing? Anyone else found a Cusano they really liked? Daniel – I had mentioned before that I’d like to take part in the blinders but I wanted to make sure you got me down for it. Here’s hoping you and Tony both have a Merry Christmas and a helluva 2011!